Above is a screen shot from a profile page on CacheFace.com (click to enlarge). 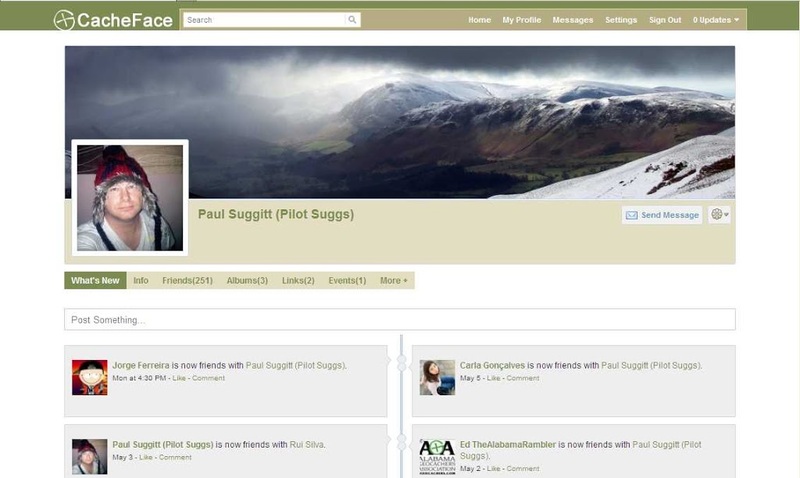 It also happens to be the profile of Paul Suggitt (Pilot Suggs), the creator and owner of the website, who has graciously agreed to be interviewed by this blog! CacheFace is, as stated in the post title, a dedicated social network for Geocachers, launched in 2012. You can read an excellent overview of all it’s features on the about-CacheFace page on their website. There are more screen shots of the site at the bottom of this blog post. OCNA BLOG: (Every one’s first question) Where are you from, how did you first hear of Geocaching, and when did you start? PAUL: I am from the North East coast of the UK, a town called Hartlepool and I got into Caching late in 2010 after my best friend Ian White (Ian D+P) mentioned it. After my first cache find, i was hooked..I now have 1,477 cache finds under my belt and also have a number of caches out in my home town and the English Lake District. OCNA BLOG: Can you describe all the major features of it? Is the “Face” an intentional play on Facebook? PAUL: I developed CacheFace to give something back to the global geocaching community, a community I found from the geocaching meets that was very friendly and extremely passionate and I have given this back by way of using my programing skills to develop a global hangout where every cacher can connect and share, no matter where they are. CacheFace is a dedicated social network for cachers to connect with each other. One thing for sure is it’s not trying to compete with Facebook. The idea behind CacheFace is to bring the fragmented caching groups that exist on various social networks and forums around the world and allow all these cachers to come together in 1 place and hang out, make new friends, share tips and ideas, create global groups for their interests (travel bugs, caching containers, etc), something that wouldn’t normally happen as people wouldn’t normally venture out of their local group hangout. That’s now changed.. CacheFace has created a new type of caching…social caching. The name CacheFace is actually from a slogan I created from seeing some photo’s of myself and my pals caching and we all had a “caching face,” be it happy, tired, exhausted or silly, so when I was developing the site it felt appropriate to use CacheFace…i.e, connect with each other and show everyone your cache face. OCNA BLOG: I understand it’s less than a year old. When was it launched? Is the growth in the early stages what you expected? PAUL: CacheFace was launched on the 21st October 2012, and the membership signups have beaten all expectations in the time its been live. Daily there continues to be new members joining up from all parts of the world. OCNA BLOG: There are a small amount of ads, and more recently, member discounts. I understand you have pledged that CacheFace will always be free? PAUL: There are a small amount of ads on the site, and these ads are purely caching related and any revenue made simply goes towards running the site. CacheFace is free to join and use and always will be. There are no hidden extras to subscribe to. CacheFace has been set up to serve the global caching community and I don’t want them to have to pay for that privilege. 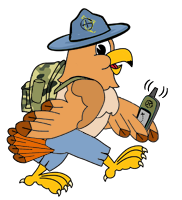 I recently launched the member benefits section as I want our community to totally benefit from being a member on the site, not just with the way they can connect with each other, but with other benefits such as discounts on their SWAG and other geocaching products and services. OCNA BLOG: The Mobile version of the website works very nicely. Are there plans for Smartphone apps specific to Android, iphone or Windows Phone? PAUL: I have plans in place for introducing an iOS, android and windows phone app for the site that will again be free to download and use, to help our members get more from their CacheFace experience. OCNA BLOG: There are many privacy settings on CacheFace. Were those built in originally, or were they added later by request of some of the members? PAUL: The privacy settings have been there since the sites launch as I want members to be able to decide on what level of privacy they have on site. This keeps the member completely in control. They can decide who sees their posts, who can contact them, mark themselves private so they don’t appear in the public members directory and more. Members are completely in control of their privacy at all times.The site itself is completely encrypted with a 256bit SSL certificate so all browsing and interaction on site is secure. OCNA BLOG: Did you write the whole website yourself? PAUL: I did write the site myself. The site has been developed on a php framework that is very robust and utilises the latest technologies to help bring the best usability experience to members. I have an ongoing development list to continually introduce new features that are of benefit to the site / members. In other words, it’s lightning fast! The blogger was going to mention that if Paul didn’t himself. It is a simple to use, yet well-designed website. Give it a try! After some trial and error here with the Blogger software, it looks like the easiest and most effective way to post some screen shots of CacheFace is via links, which take you to a somewhat decent full-sized view on my personal Flikr account. We joined CacheFace in mid-November 2012 and LOVE it! We aren’t as active as we used to be, or even as much as we would like to be, but that has been the case for us across the board lately. Everyone is great over at CacheFace and we highly suggest the site! Nice write-up!